Evidence shows that Mars was once like Earth with an ocean of Water and a similar atmosphere to what we have on our planet today. NASA confirms today what caused the planet’s atmosphere to escape, leaving it vulnerable to radiation that transformed it into the cold dry world we have been exploring for half a century. Unlike the previous rover missions such as Curiosity, Spirit and Opportunity, MAVEN did not touch down on Mars but remained in orbit to study the planet’s atmospheric properties. NASA scientists designed MAVEN to determine why the atmosphere is so thin now and what happened to the planet’s moisture. “Understanding what happened to the Mars atmosphere will inform our knowledge of the dynamics and evolution of any planetary atmosphere. Learning what can cause changes to a planet’s environment from one that could host microbes at the surface to one that doesn’t is important to know, and is a key question that is being addressed in NASA’s journey to Mars,” said John Grunsfeld, associate administrator for NASA’s science mission directorate. In order to determine what happened to Mars’ water we have to understand what happened to its atmosphere. Thanks to the MAVEN spacecraft, we know that Mars is losing its atmosphere at a rate of 100 grams per second which is like the planet shedding one quarter-pounder each second. This may seem like a lot but at this rate it would take billions of years for the planet to lose its atmosphere, indicating to scientists that the rate of escape must have been more significant in the past. New data indicates that Mars lost a substantial amount of its atmosphere early on in its history, and the process could be driven by periods of intense solar bursts. The science team reached this conclusion after studying a particular set of MAVEN data collected earlier this year. On March 8, 2015 MAVEN observed an interplanetary coronal mass ejection (ICME), which is a burst of gas and magnetism emitted by the Sun. 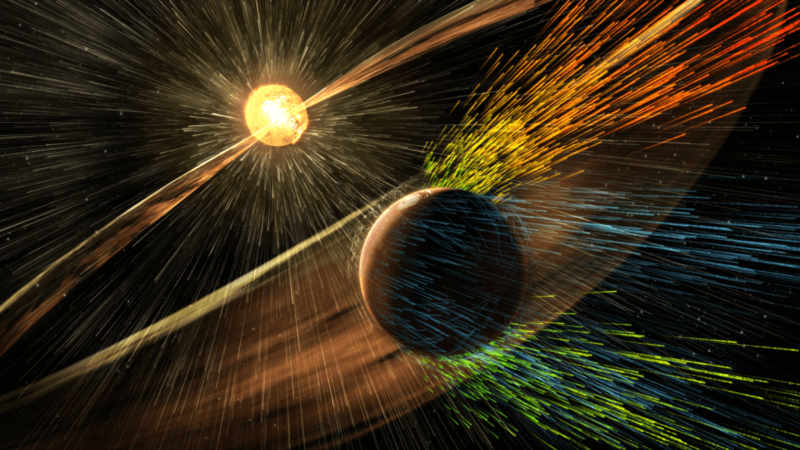 During the solar event, MAVEN monitored both Mars’ magnetic field and atmospheric ionization. The data showed that as the planet was struck by the ICME, strong magnetic rotations in the form of rope-like tendrils within Mars’ magnetic field fluxed as high as 3,107 miles (5,000 kilometers) into space. At the same time, MAVEN’s instruments observed dramatic spikes in the amount of ions spewing into space, with the highest concentration occurring along the flux ropes. So, basically, the magnetic tendrils served as slingshots, launching oxygen (O2+) and carbon dioxide (CO2+) ions into space. ICME-like conditions are thought to be prevalent early on in the Solar System’s history, which suggests that ion escape rates at that time were driven by major solar events. As part of its mission, MAVEN has conducted several dips into the Martian atmosphere in order to learn more about the planet’s thermosphere and ionosphere. MAVEN data shows a massive vertical temperature gradient indicating that a continuous mixing of carbon dioxide, argon and nitrogen dioxide is occurring. Researchers have also measured higher amounts of oxygen than previously predicted. MAVEN detected a substantial difference in the densities of these elements at an altitude of 124 miles (200 kilometers) that varied significantly from orbit to orbit. The density variations along with the temperature differences show that the structure of the upper atmosphere also varies from orbit to orbit. This could be driven from below, by small-scale atmospheric mixing processes or interactions between global winds and gravity waves. Variations in both density and temperature occurring at high altitudes plays a role in atmospheric escape. Understanding how the solar wind interacts with the Martian atmosphere and what effect the interaction has on atmospheric escape will help scientists better determine what happened to Mars’ atmosphere. Could this happen here on Earth? Well, luckily the Earth is protected from the harsh solar wind by its magnetic field. If the Earth’s magnetic field was ever permanently shut off then eventually the planet would become a larger version of Mars, but really it’s nothing we have to worry about. 100 Year Starship: An Interstellar Leap for Mankind?